#NationalPoisonPreventionWeek is coming up (3/17-3/23) – an annual awareness campaign to keep dogs and cats safe at home. Check out this list of the top 5 dangers lurking in your house! Both indoor and outdoor plants can be toxic to your pets. Check out the ASPCA’s list of plants to find out which ones to stay away from and which are safe. 2) Your refrigerator and pantry. Some foods that are safe for humans can be dangerous to dogs and cats. 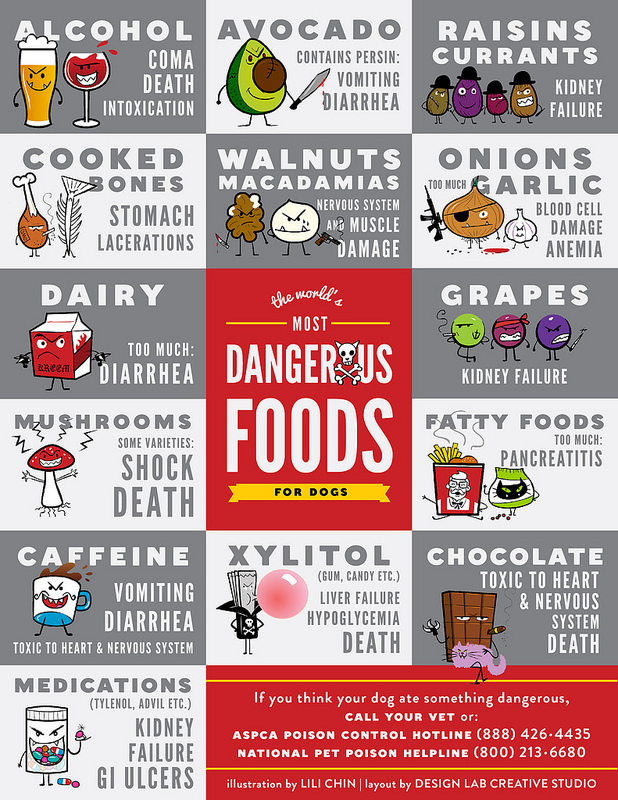 Order one of Lili Chin’s magnets (see graphic above) so you have a consistent reminder not to feed your pets these dangerous foods. There are plenty of human foods that are perfectly safe for pets – learn more about incorporating these safe foods into your pet’s diet! From toilet bowl cleaners to air fresheners to floor cleaners, these items usually contain toxic chemicals that your pet may ingest just walking around in your house and then licking their paws or trying to get a drink out of an open toilet. Switch to cleaners with natural ingredients and keep pets out of spaces where you’ve used harsh cleaners. While a variety of oils can be helpful with medical and behavioral issues, it’s important to know which oils are dangerous to pets and it’s also very important to remember to dilute the safe oils before use! Keep your pets healthy by switching to pet safe items, making note of your nearest 24 hour emergency vet, and saving the ASPCA’s Poison Prevention Hotline on your phone. Pet Insurance can be very helpful as well if your pet ingests something they shouldn’t – Sara recommends Pet’s Best pet insurance and uses it for her own pets!